I grew up eating Leg of Lamb and have enjoyed preparing it myself many, many times. I have also enjoyed grilled Loin Lamb Chops and Rack of Lamb but until recent years, I'd never had Lamb Shanks. I'm not sure if that's because they simply weren't available as a choice back when I was a girl, or what, but I don't ever remember anyone even talking about shanks ... I mean what is a shank? According to Wikipedia, a meat shank or shin is the portion of meat around the tibia of the animal, the leg bone beneath the knee. 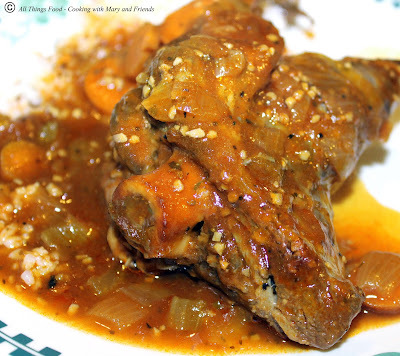 Lamb shanks are often braised whole; veal and beef shanks are typically cross-cut. Of course after I found out what a lamb shank was, I realized it was the long narrow portion on the leg of lamb. Ahhh haaaaa! Now I knew what it was and realized I had tasted it before, just never as a separate piece from the leg. 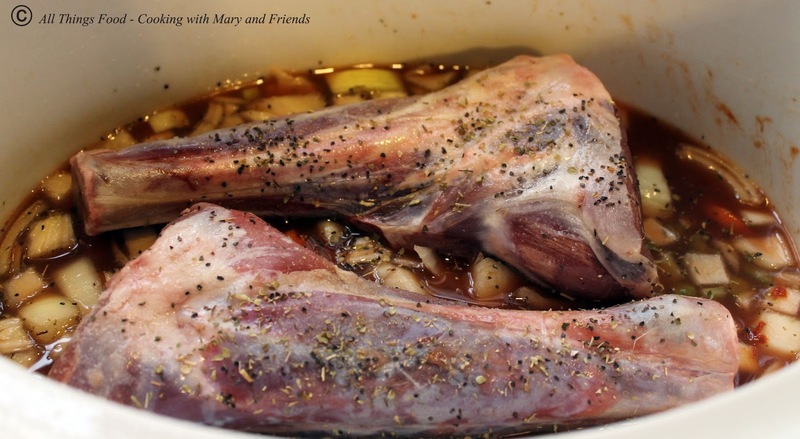 Like most less tender cuts of meat, a lamb shank is meant to be braised and slow cooked. Doing so creates the most flavorful dish I've ever had and the meat is falling off the bone tender. 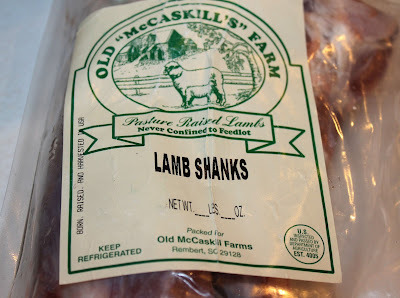 These lamb shanks came from my friends at Old McCaskills Farm and are so good. Spray a large slow cooker with cooking spray. Place diced celery, onion and carrots on the bottom of the slow cooker. Add the tomato paste, minced garlic, oregano, thyme leaves, salt, pepper, red wine, red wine vinegar and chicken stock, stirring well to combine. Place lamb shanks on top and ladle some of the sauce over top. Cover and cook on low 6 - 8 hours, or until the meat on the shanks is pulling away from the bone. Serve shanks with some sauce over rice or couscous.